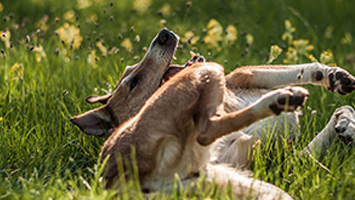 95% of a flea problem is in your pet’s home environment as eggs, larvae and pupae (cocoons). New double action FRONTLINE® PLUS not only kills fleas and ticks on your pet, it contains active IGR technology that stops flea eggs from hatching and larvae developing in your home. 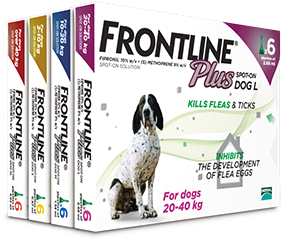 Enhanced household protection – by preventing flea eggs from hatching, FRONTLINE® Plus breaks the flea life cycle, helping to protect both the pet and the home. Puppies should be at least 8 weeks old and weigh at least 2 kg. Kittens should be at least 8 weeks old and weigh at least 1 kg. Do not use on sick or convalescent animals. Do not use on rabbits. Can be used during pregnancy and lactation. 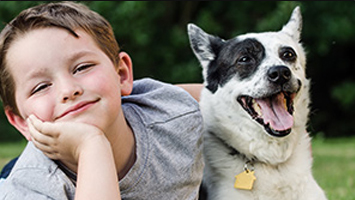 Using new double action FRONTLINE® Plus every four weeks helps protect pets from fleas and ticks. And its active IGR technology stops flea eggs from hatching and larvae from developing in the home.